Freelance Freelance writer Kelsey Raynor pays tribute to her late relative Barnsley-born George Raynor, who managed Sweden to the later stages of two World Cup finals in an amazing career which finished as boss of Doncaster Rovers, but is sadly little remembered in English football circles. Born Born in Hoyland, South Yorkshire on the 13th of January 1907, George Raynor had grown up in an area dominated by coal miners. George Raynor at the time he took over at Rovers with his wife, Phyllis and youngest son, David. Little did we know that George’s upbringing in this mining town would produce one of England’s greatest football managers. From an early age, academic success and football became part of George’s daily life. In his autobiography Football Ambassador at Large he informs readers that he was in the Standard 7 aged 10 and attended Barnsley and District Grammar, whose pupils also included Dickie Bird, after receiving a County Minor Scholarship. George later started an apprenticeship at his local butchery but not having Saturdays, the day of sport , to himself soon saw him resign and become a labourer. This resulted in him meeting his wife, Phyllis Whitfield in Elsecar. Phyllis had been a member of the Bible Class near to where George trained and she informed him of the Elsecar Bible Class’ football team where George’s playing career began. In 1929 George Raynor signed for Wombwell, where the majority of the Raynor family live to this day. A long and significant career followed after he was repeatedly watched by scouts. George played for Sheffield United, Mansfield Town, Rotherham United, Bury and Aldershot where the 1939/40 season had only lasted three matches before the declaration of World War II. George signed up to be an Army PT Instructor but was exempted in July 1940 following a knee injury suffered at Aldershot. But he did see service overseas while continuing to play football. He was posted to North Africa before transferring to Iraq where his management career began with Iraq. In 1946 Stanley Rous released George from Aldershot and recommended him to Sweden - a move which led to George’s most prodigious moments in football, managing the team from 1946 – 1954 and 56-58. In 1948, they famously won the Olympic Games defeating Yugoslavia 3-1 in the final at Wembley. Then once again, in the 1950 FIFA World Cup in Brazil, the Sweden beat Italy to finish in third place after defeat to the later champions, Uruguay. Sweden went on to take a bronze-medal at the 1952 Olympic Games in Helsinki. George managed a host of other clubs before and after his first spell in charge of Sweden but returned for his second stint in 1956 and led Sweden to what remains today their best ever achievement, finishing runners-up to Brazil in the 1958 World Cup. Brazi won the final 5-2 in a tournament which saw the debut of a little-known 17-year-old Pele. Settling in Skegness where he could provide his youngest son, David, an English education, George found work at aButlin’s holiday camp and as a PE teacher at a local school. 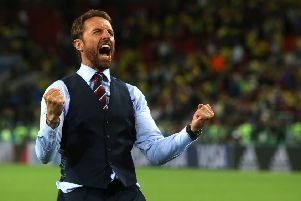 Despite having been offered an array of football-related jobs, George didn’t want to settle for anything less than managing England after his success in Sweden. However, a lack of interest was shown towards George and became manager of Skegness Town in 1958, not long before managing Sweden for a one-off game at Wembley against England, who lost 3-2 in a result described as an embarrassing defeat. George managed Doncaster Rovers from June 1967 to November 1968 before being diagnosed with Alzheimer’s linked to cerebral vascular disease which ultimately lead to his death on November 11 1985 in Buxton. Laid to rest in the grounds of Trinity Church in Elsecar, George’s death went unrecorded in British newspapers with no obituary notices published. More sadly, his legacy went unpreserved and unnoticed by many, despite his unique approach and brilliant record.